Founded back in 2014 in Silicon Valley, Droom’s fully transactional website is ready to hit the online market with a big bang. 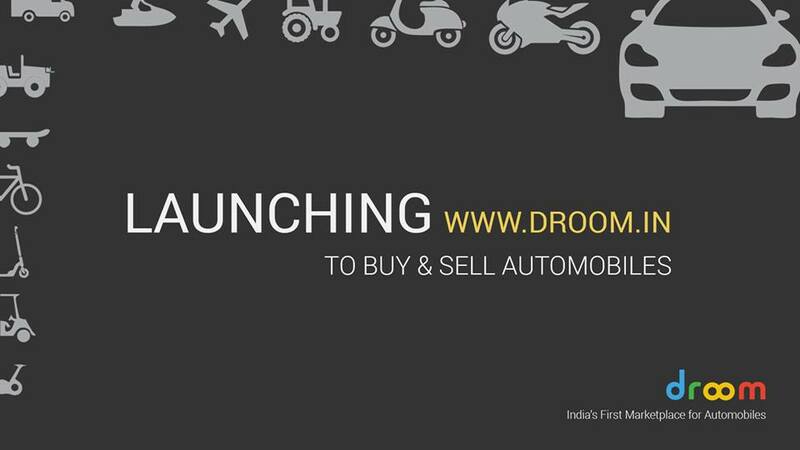 Droom.in will be India’s first marketplace allowing buyers and sellers to buy and sell automobiles online. After the successful launch of droom android mobile app back in Nov. 2014, company is expanding its wings to all the platforms with the launch of a functional website. From new to used cars, motorcycles, bicycles, scooters, and may be even planes in near future, customers can buy and sell almost any kind of automobile through the single platform. With innovative technology and disruptive approach, company is presenting entirely new concept to buy and sell vehicles using internet. Droom’s platform is a fully operational marketplace that is sure to benefit individual sellers, automobile dealers, and of course serious buyers. Droom website offers ease of use with self-explanatory tabs and options. You can get plenty of discount coupons, wide categories, most popular vehicles, and best sellers along with over hundred top auto brands and reliable sellers & buyers. Customers can scour through Buyer Central and Seller Central to get detailed information about plenty of benefits they receive exceptionally at droom.in, not found elsewhere. So, make your way to droom.in and buy car online or your dream motorbike.Hurry! I have gone through your site, it is very fine to know the buyer and seller come under one roof.I am from hyderabad with haveing local contacts.I wanted to know more about the auction to be taken place were.Please let me know the way you deal with buyer and saller. I was just looking at your Droom Launching Fully Functional Website to Buy and Sell Automobiles! – Droom website and see that your site has the potential to become very popular. I just want to tell you, In case you didn’t already know… There is a website service which already has more than 16 million users, and most of the users are interested in topics like yours. By getting your website on this service you have a chance to get your site more visitors than you can imagine. It is free to sign up and you can read more about it here. I was very pleased to search out this web-site.I needed to thanks to your time for this wonderful read!! I undoubtedly enjoying every little little bit of it and I have you bookmarked to check out new stuff you blog post.